Instagram made some very big changes to authentication process. About 70% of our users are affected by them. Sometimes Instagram decided that login from SNAP is “unusual” and asked for confirmation. You just had to open Instagram on your phone and tap “This was me” button on “We have detected an unusual login attempt” screen. About 30% of accounts are not affected by the change at all. They work as they worked before. <li style="padding:10px;">About <strong>15% of accounts</strong> require to enter the code from email or SMS and confirm the &#8220;unusual&#8221; location from the phone. SNAP supports this type of authentication starting from SNAP API 4.0.42. 4. It will work fine after that. (Unless you get a different error). Sometimes Instagram decides that login from SNAP is “unusual” and asks for confirmation. Until yesterday, you just had to open Instagram on your phone and tap “This was me” button on “We have detected an unusual login attempt” screen. Yesterday this stopped working. Instagram is still asking you to confirm the login, but confirmation has no effect on the actual login anymore. You are still going to be told that “checkpoint_required” next time you try to use SNAP. So we had to switch to a different way of Instagram account confirmation. Please update your plugin to the version 4.1.1. When you click “Send test post to Instagram” and Instagram decide that your login is “unusual”, you will be asked to enter the code. Please check your Instagram email or phone message for the code and enter it. SNAP will be working fine with Instagram after that. * New – “SNAP Quick Post” custom post type is now available in reposter. * Improvement – Better protection against duplicates. * Improvement/Bug Fix – [Instagram] We have added a different way of dealing with “checkpoint_required” message. * Bug Fix – [StumbleUpon] “Invalid Token” issue. 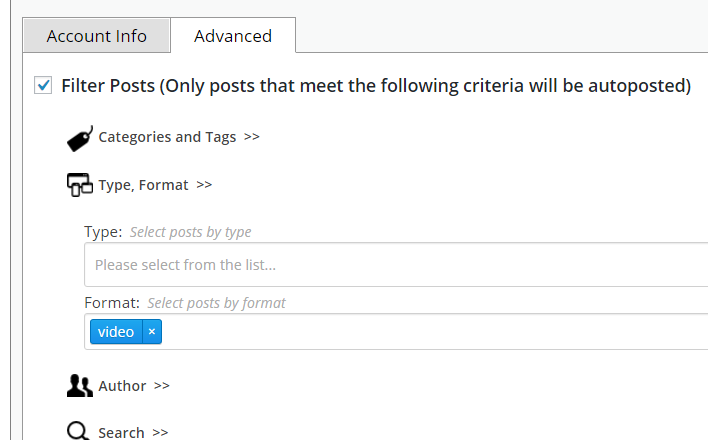 SNAP for WordPress Version 4.1 has been released. This version adds support for WPML and Polylang in filters and one new network – Messenger Line. It also eliminates the necessity to “Save” WordPress post after making changes to SNAP message format. * New [Beta] – WPML and Polylang support in Filters. * New/Improvement – [Post Edit] – All changes are saved instantly. No more “Please save the post to apply changes”. * New – [Instagram] “Default Image” field in settings. * Bug Fix – [Twitter] Option “Dash” has been removed from “Replace spaces in hashtags with …” because Twitter no longer supports dashes in hashtags. * Several minor bug fixes. SNAP for WordPress Version 4 has been released. This is the biggest SNAP update ever. Almost 100% of the code was re-written. 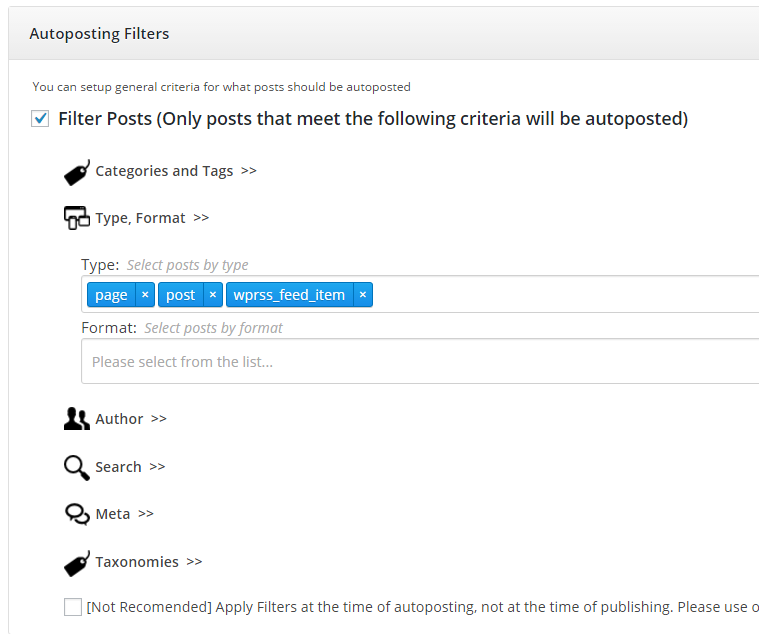 – New Autoposting Engine. Faster and 180% more efficient engine. It takes less memory and resources to preform autoposting jobs. – Old Posts Auto-reposting. 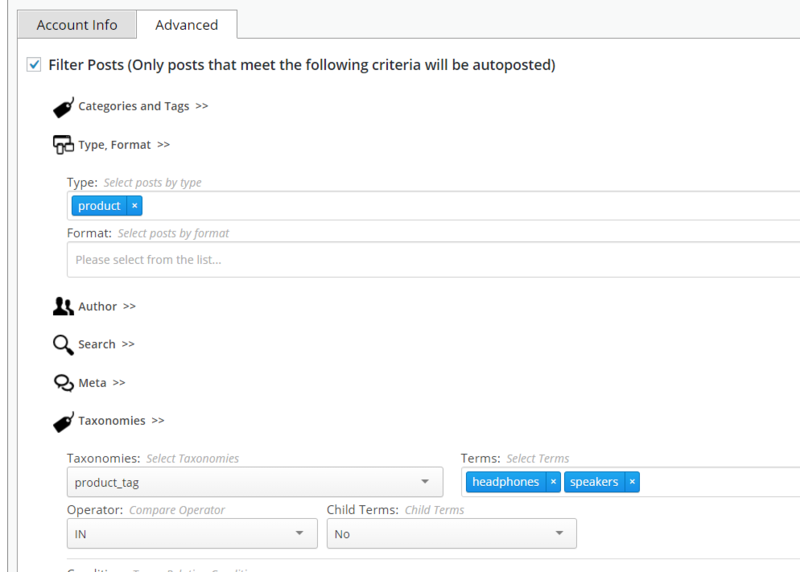 Automatically post your already existing posts to your social media accounts. – Filters. 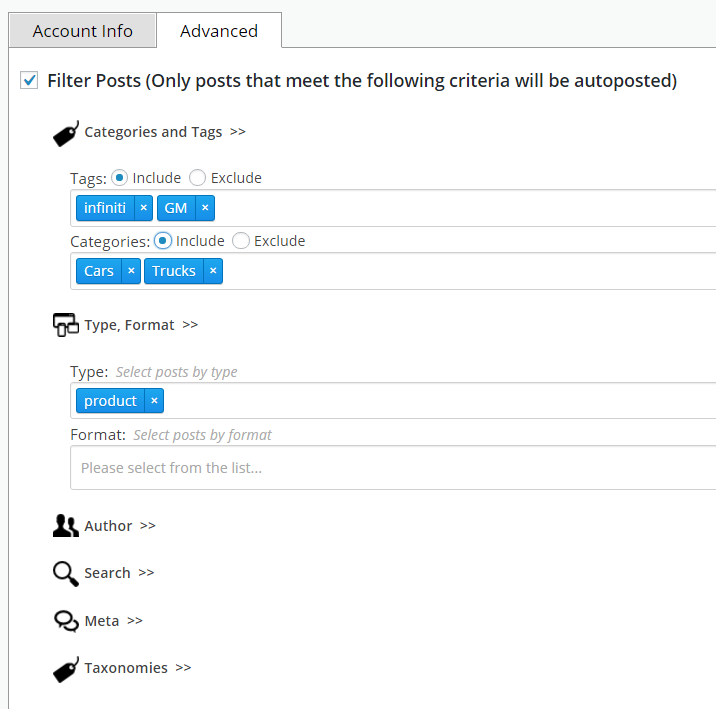 Filters allow you to post only specified categories, tags, post types, etc… to each Social Network account. – Query/Timeline. New dedicated page to see all future jobs – postings, re-postings, scheduled and queried posts. – New mobile friendly Interface. New interface is easier to use and much more mobile friendly. No more entering Facebook URLs and figuring out your Facebook groups IDs. No more coming back to finish configuration. Please enter your key and secret and click “Authorize”. Then just choose your profile, page or group from the dropdown list. Facebook also finally dropped obsolete “Attached link” style in favor of “Shared link”, so less complication there as well. LinkedIn got more options and features. Premium NextScripts API got support for rich text “Pulse” posts. Support for new built-in LinkedIn v2 API also has been added. LinkedIn v2 API allows posts to company pages, so free plugin users can do that now. LinkedIn also got the same brand new interface as Facebook. You can just enter your key and secret or username and password and select your profile, page or group from the dropdown list. 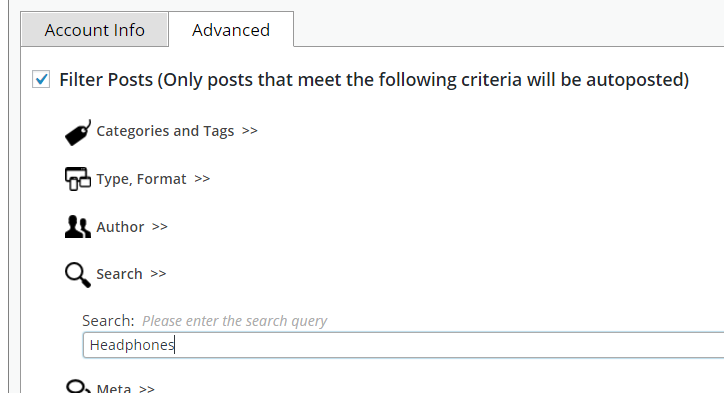 Posts could be filtered by Type, Format, Categories, Tags, Meta (Contents of custom post fields), Taxonomies (custom post attributes like product categories or tags), Author, and a search keyword. 1. Post only posts assigned to categories “Cars” or “Trucks”. 2. Post only video posts to youtube account. 3. Post only posts about “Headphones”. NextScripts API for Instagram will be available for all active API subscribers Friday March 5, 2016 as part of the Universal API.